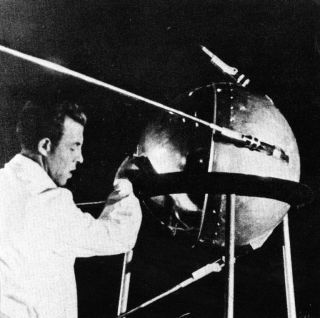 A Soviet technician works on Sputnik 1 before the satellite's Oct. 4, 1957, launch. There may actually have been three Sputnik moments. The Soviet Union's Oct. 4, 1957, launch of the first-ever artificial satellite, Sputnik 1, created quite a stir, to be sure. It did kick off the space age, after all. "The way I tend to phrase it is, you get three strikes, and you're out," Launius told Space.com. The launch of the beach-ball-size Sputnik 1 did not come as a shock to American national-security officials, who had expected something big was in the works. But it did catch the public off-guard, Launius said. "It wasn't that everybody was running around with their hair on fire," Launius said. "They're not afraid of this. It's sort of, a new age has dawned — this is exciting." He pointed to a standard, previously scheduled news conference held by President Dwight Eisenhower the week after the launch. "The media at the time asked him a couple of questions about Sputnik, and then they moved on to other things," Launius said. "The big story of the day was the Little Rock crisis — are you going to bring in federal troops to desegregate the Little Rock [Arkansas] school system?" But the mood shifted noticeably on Nov. 3, 1957, when the USSR successfully launched Sputnik 2 to orbit, Launius said. And then came strike three. On Dec. 6, 1957, the United States tried to loft its first satellite, a 3.5-lb. (1.6 kg) craft called Vanguard Test Vehicle 3. The satellite's rocket exploded just after liftoff in a spectacular failure shown live on national TV. "People are concerned at that point, and justifiably so," Launius said. "It looks like the Soviets could do nothing wrong, and the Americans could do nothing right." This concern was not merely a consequence of wounded national pride. The United States soon joined the Soviet Union as a spacefaring nation, launching the Explorer 1 satellite on Jan. 31, 1958. "It certainly salved the open wound; there's no doubt about that," Launius said of Explorer 1, which famously discovered the Van Allen radiation belts surrounding Earth. But this success didn't erase all memories of the wound. Over time, the three-tiered Sputnik moment spurred the U.S. government to ramp up the nation's technological capabilities, Launius said. For example, the Advanced Research Projects Agency (which was later renamed the Defense Advanced Research Projects Agency, or DARPA) was created in February 1958. In September of that year, Congress enacted the National Defense Education Act, which was designed to boost the number and quality of American scientists and engineers. And NASA began operations shortly thereafter, on Oct. 1, 1958. Despite such measures, the Soviet Union notched the next big space-race milestone, ushering in the age of human spaceflight by launching Yuri Gagarin to orbit on April 12, 1961. By the end of the decade, however, the United States had claimed perhaps the biggest prize: landing astronauts on the moon and returning them safely to Earth.